Yesterday, I posted a recap of the OpenStax College Launch presentation that we attended as part of last week’s 2012 Connexions Conference. As I mentioned, that presentation was one out of two presentations that were most applicable to our Saylor.org students and fans. Today, I want to quickly run through the second presentation that many of you will find exciting: the panel on Alternative Certification, during which our director, Alana Harrington, presented her thoughts on how we at Saylor envision employing badges to provide incentives and give meaning to the studies of each of our students. The panel consisted of four well-spoken and extremely knowledgeable ladies: Carla Casilli, Project Manager of the Open Badges project at the Mozilla Foundation; Sheryl Grant, Director of Social Networking at HASTAC; Susan Goldberger, Director of Education and Career Advancement Services at Burning Glass; and our own Director, Alana Harrington. Carla Casilli kicked off the panel by providing an overview of Mozilla’s Open Badges project. 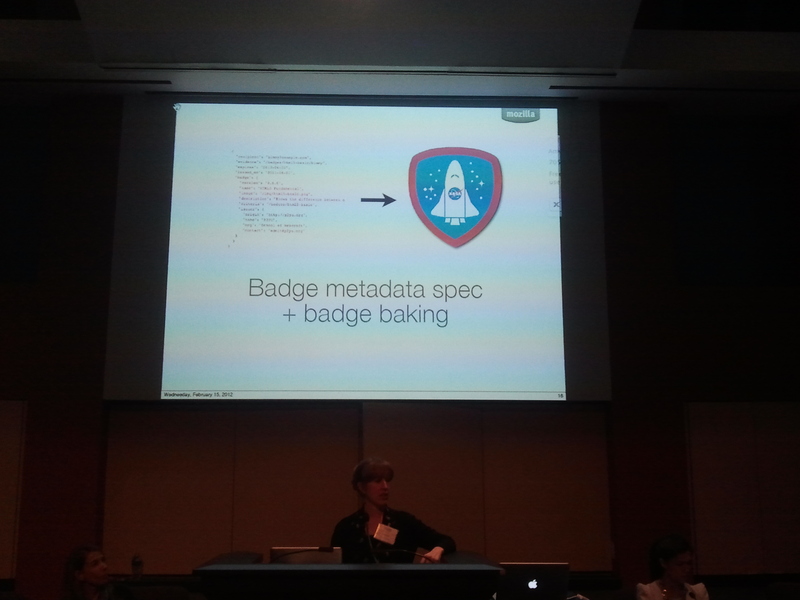 When most people outside of the Open Education community hear the word “badge”, they may think of something akin to merit badges, or what a boy scout receives upon successfully completing a major project or goal. While Open Badges are also earned as a result of successfully completing something major (like a college course! ), there is much more to them than the colorful felt patch conjured in many individuals’ minds. As Carla explained, badges can be used to capture both formal and informal learning – and indicate specific skills and experience gained in these learning environments. Not only could badges be rewarded to students after passing an OER course (like on Saylor.org) or even a traditional college course, they can also be earned in instances such as mentorship programs, volunteering and learning networks. And what’s more, there are intricate levels of specific metadata associated with each badge so that, when someone clicks on a badge, they can see where an individual gained the skill associated with that badge, what they needed to do in order to earn the badge, and, if appropriate, at what level they successfully completed or passed the corresponding task or assessment. If you head over to Mozilla’s Open Badges page, you’ll see a detailed explanation about badges and how they might work. Sheryl Grant then took the microphone to walk the audience through the Digital Media + Learning Competition (DML), which aims to “gather leading organizations, learning and assessment specialists, designers and technologists to create and test working badge systems in the wild.” This competition is, really, a huge jumpstart to this exciting open badges initiative by incentivizing organizations to devise plans to implement badges. The competition is wrapping up, and winners will be announced on March 1, 2012 at Mozilla’s DML Science Fair. Have questions on this whole badge thing? Check out Sheryl’s Questions and Answers: Badges 101 post, which will almost certainly clear up any questions you have. After Sheryl wrapped up her overview of the DML Competition, Alana took the stage to give a quick overview of the Saylor Foundation and how badges might integrate with our courses. She gave three scenarios – scenarios very common to Saylor.org students – in which badges can be beneficial: alternative education; supplementary education; and workforce education. Alternative education refers to those students who are excluded from the traditional education system in one way or another. Those students could visit Saylor.org, work their way through all the content they would need to know in order to obtain the equivalent of a degree in a chosen discipline, earn a badge course by course – and eventually obtain a Saylor Graduate Badge. In the “supplementary” scenario, students currently – or formerly – enrolled in accredited institutions could work to acquire badges that would supplement their traditionally acquired credentials. And finally, as Alana pointed out, to receive promotions and upward mobility in the workplace, there is a massive pool of workers who are in need of alternative certifications and credentials outside of the traditional. With badges, it could be possible for these workers to take free courses – like those offered at Saylor.org – and show the earned badges to their employers (or potential employers) for mobility. The final presenter on the panel was Susan Goldberger of Burning Glass, a really neat non-profit that works to match people to jobs. What’s so interesting about Burning Glass is that the organization effectively deconstructs the traditional labor market into stackable skills – meaning that, rather than rely on a traditional 4 year degree to obtain a dream job, individuals can learn the specific skills they need in order to be a qualified candidate. So, you might see the direction where Susan took her presentation: by utilizing badges to indicate which skills individuals have gained, they will be able to prove to potential employers that they’re the right person for the job – rather than rely on their resume alone. The panel generated quite a bit of buzz – and a lot of great questions. What questions do you have about badges and how the Saylor Foundation is planning to implement Open Badges? Let us know by leaving a comment below! Photo Credit: Camie Rodan. This photo shows Carla Casilli explaining the Mozilla Open Badges project. We snapped a few additional photos at the event, which are posted on our Facebook page here. 2012 Connexions Conference: Laying the Foundation for Significant ChangeOpen Education Week: Kicking off on Sunday!